Organised by The Hong Kong Federation of Youth Groups and HKU DreamCatchers, the two-day Global Youth Entrepreneurs Forum 2017 commenced today (13 Jun) at The Lee Shau Kee Lecture Centre of The University of Hong Kong, attracting over 1,000 young entrepreneurs from 33 countries and regions around the world, to engage in discussions. Under the theme “WE THE FUTURE”, the Forum will also go the most innovative city in Mainland China, Shenzhen, visiting the Qianhai Shenzhen-Hong Kong Youth Innovation and Entrepreneur Hub (E Hub) tomorrow(14 Jun). The Honourable Nicholas W. YANG, JP, Secretary for Innovation and Technology, Mr. K. M. WONG, BBS, JP, Director, The Victor and William Fung Foundation, Mr. YANG Cheng-wei, Deputy Director-General, Department of Youth Affairs, Liaison Office of the Central People’s Government in the HKSAR, Mr. SUN Hai-wei, Assistant Director of Shenzhen Qianhai Authority, Mr. LIU Guang-yang, Chairman of Shenzhen Youth Federation, Professor Peter MATHIESON, President and Vice-Chancellor, The University of Hong Kong and Dr. Rosanna WONG, Executive Director of The Hong Kong Federation of Youth Groups attended the Opening Ceremony. Ms. Sabrina W. FUNG, Group Managing Director, Fung Retailing Limited and Mr. Dov MORAN (Israel), Managing Partner, Grove Ventures and inventor of the USB memory stick, delivered speeches. “We are very pleased to organise the Global Forum for the last four years. We are thankful for the continued support given to the young entrepreneurs, and to remind them of the importance of innovation and creativity in determining the future. 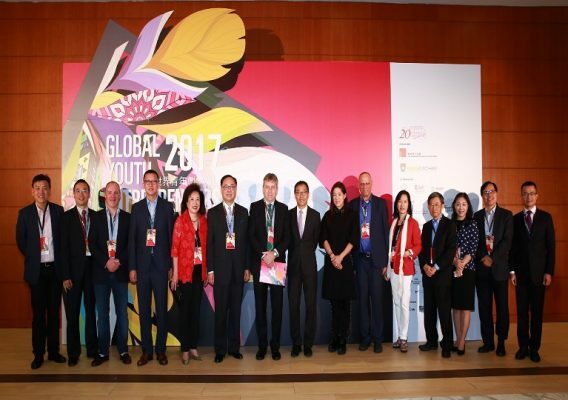 The Forum offers them the great opportunity where they share their entrepreneurial plans and learn from their peers around the world,” said Dr. Rosanna WONG, Executive Director of The Hong Kong Federation of Youth Groups. Dr Wong also expressed gratitude to the major sponsor, The Victor and William Fung Foundation, The Dragon Foundation and all other Forum’s partners and supporting organizations. Leading figures from various fields and startups form a speaker line-up at the Plenary and Breakout Sessions that include Mr. Net JACOBSSON, Co-founder & Partner, SparkLabs Global Ventures (Israel/Sweden), Ms. Sandy DIAO (Director of Strategic Programs, Indiegogo) (USA); Mr. Leong CHEUNG, Executive Director, Charities & Community, The Hong Kong Jockey Club, Mr. Albert WONG, Chief Executive Officer, Hong Kong Science and Technology Parks Corporation, Mr. Antony LEUNG, Group Chairman & CEO, Nan Fung Group, Mr. Ming-wai LAU, Deputy Chairman, Board of the Ocean Park Corp., Prof. W John KAO, Vice-President and Pro-Vice-Chancellor (Global), The University of Hong Kong, Mr. LAM Yat Hei, Co-founder, TVMost and Mr. LAW Wing Chung, Former Political Assistant to Financial Secretary. Altogether there will be over 70 speakers and moderators from Sweden, Israel, Netherlands, United States of America, Canada, India, Ecuador, France, United Kingdom, Australia, Mainland China, Hong Kong and other countries sharing their inspiring ideas on the hottest issues, including innovating global businesses, deconstructing fast-growing companies, Asia Entrepreneurship Blooms and suchlike. The Pitching Demonstration will offer a world stage for six selected local entrepreneurs to showcase their innovative ideas that foster social change. Each team will have a presentation and Q&A session. The “Judges’ Choice Award” will be selected by a professional global judging panel and the audience can make their voice count through voting for “People’s Choice Award”. The exciting journey will continue tomorrow (14 Jun) to the E Hub a start-up hotspot in vibrant Shenzhen. Mr. LIU Guang-yang, Honorary Chairman of Shenzhen Youth Federation and Dr. Rosanna WONG, Executive Director of The Hong Kong Federation of Youth Groups will officiate at the Ceremony. Leading figures from various fields and start-ups will gather to discuss innovative developments in the future, how blockchains reshape the economy and the world. Also to be discussed are China’s innovative trends from various international perspectives. The Hong Kong Federation of Youth Groups organised the first Global Youth Entrepreneurs Forum in 2014, and has built a global network of over 3,500 participants from over 30 regions and countries. HKU DreamCatchers held its Inaugural Forum in 2015 with Mr. Pony Ma and 60 other speakers. It is HKU’s flagship entrepreneurship initiative with a vibrant network of 3,000 students, alumni, friends and collaborators.